What is the Seren Kodi addon? Is it Safe and are there Alternatives? The Seren Kodi addon has exploded onto the third-party Kodi scene in recent weeks. 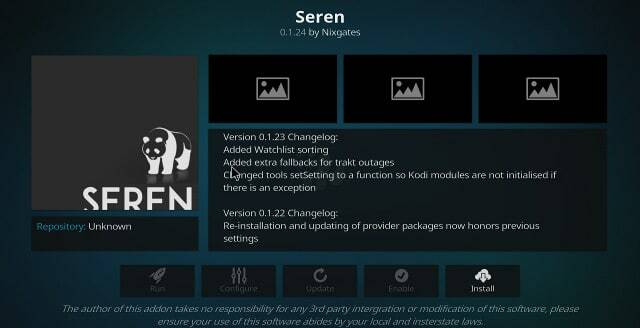 But what is the Seren Kodi addon, and is it an addon worth downloading and using? Below, we’ll explore the Seren addon from Nixgates in more detail, including whether it’s safe to use and what alternatives you may want to use. Kodi is a free, open-source media player. It lets users enjoy their home entertainment content and doesn’t require significant effort to set up. This media player is available for many different devices such as Windows, Linux, and Mac PCs, Android devices, iPhones, the Roku streaming TV Box, the Apple TV, the Nvidia Shield, Amazon’s Firestick and Fire TV, the Raspberry pi, and more. One of the outstanding features of Kodi is that its addons are uniform with most of them being interchangeable between platforms. Warning: Kodi should only be used for content to which you have the legal right to access. Neither the Kodi Foundation nor Comparitech advocates the use of Kodi for piracy. You ISP has access to all of your streaming data. In some countries, ISPs can even share your streaming and browsing data with thirdparty companies to make a quick buck. The risks to your privacy make it necessary to protect and mask your online identity. You can do this with a VPN. VPNs route your internet connection through secure servers, ultimately protecting your online activity and identity. ISPs have also been known to throttle the connection speeds of users who stream a lot of video content. If you use a VPN, your ISP won’t know if you were streaming video or not. This means you can stream as much HD and 4K content as you like. VPNs also offer protection against some connection hacking attempts such as man-in-the-middle (MitM) attacks and can help users bypass geographic content blocks. We have tested several options and recommend IPVanish for use with Kodi. It offers fast connection speeds, is compatible with several devices such as Windows PCs, Amazon Firesticks, and Android devices, and it is a secure solution. What is the Seren Kodi addon? The Seren Kodi addon offers movies, TV shows, and supports integration with Trakt, Real-Debrid, and Premiumize. It offers a wide range of appealing on-demand content, including popular TV shows and movies. However, you should note that this content is mostly served up via pirated content websites. Such sites are illegal in many countries such as the US, France, the UK, and Australia. For this reason, we suggest that you use official Kodi addons to meet your content needs. Seren has a large library but this third-party addon’s content is mostly unlicensed. While there are several third-party addons out there which are legitimate, there have been instances where third party addons have exposed users to danger due to malicious developers. More recently, security researchers found malware lurking in the widely-used Bubbles, Gaia, and XvBMC repositories. Thankfully, these repositories are now offline. However, the malicious coin-mining software went undetected for months, impacting tens of thousands of users. Err on the side of the caution with third-party addons. You may be able to access movies and TV shows, but you’ll also increase your risk of installing malicious software from unverified sources. In addition, some addons like Seren don’t provide legal streams. A good way to spot if content is provided to stream legally is to see what is being offered. If it’s the very best and latest movies and shows, such as those still in theatres or available only through paid services like HBO Now, then the addon is probably in breach of copyright laws. Official addons have to follow strict guidelines and are a great option for accessing high-quality content that complies with copyright laws. Many of these addons are also completely free. Take a look at our suggested alternatives to the Seren addon or see our round-up of the best Kodi movie addons. Tubi TV is a repository of thousands of films and movies. All of this content is completely free and can be accessed via the Tubi TV Kodi addon. Moreover, when you’re watching a movie or show using the Kodi addon, all ads will be filtered. While a lot of the content available doesn’t have the highest ratings, you will find hundreds of top quality titles rated Fresh on Rotten Tomatoes and with good IMDb ratings. Movies such as Air Bud from 1997 and Wolfblood from 2013 are available. You can also find shows like 3rd Rock From the Sun and Grounded for Life. The movies and shows are well organized with genre sections such as Highly Rated on Rotten Tomatoes, Indie Films, Docuseries, and TV Dramas present. You can also access Tubi TV directly from your web browser, on the 4th generation Apple TV, Amazon’s Firestick and Fire TV devices, and even on Samsung Smart TVs. Some content is restricted to the US, Canada, and the UK. If you want to unblock this content, you can use a VPN to bypass the geo-restrictions. 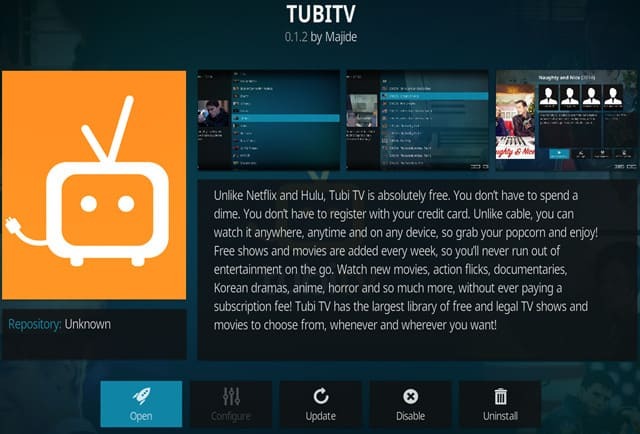 The Tubi TV Kodi addon is available directly from Github. Viewster is a free streaming service which lets you watch TV shows and movies worldwide. It has a Kodi addon which lets you access all of the content available. Although the content isn’t the most recent, you will be able to find content categories such as Korean Drama, Festival Darlings, Halloween, Thrillers, Sports, and Martial Arts. There are also some animated selections available. 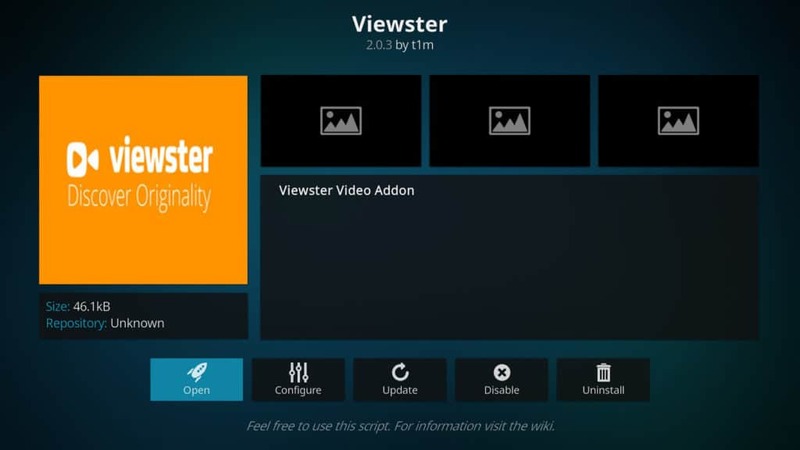 Viewster is available from the official Kodi addon repository. 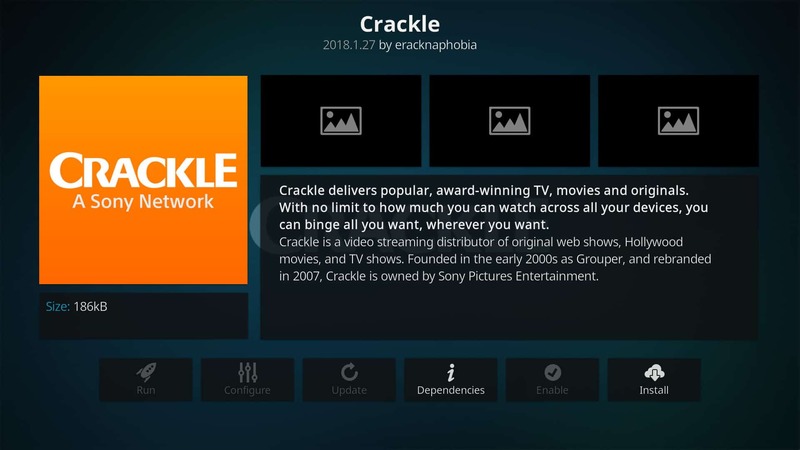 Crackle is a free VOD service which is owned by Sony (They own Tubi TV as well). It’s ad-supported but if you watch using the Crackle Kodi addon, the ads will be filtered out. There is a mix of new and old content on Crackle. There is a lot of B-level content but there are some great titles available as well. In terms of movies, there are titles like 30 Minutes or Less, and Angel of Death. You can also find TV shows like Bad Teacher and Between Brothers. The Crackle Kodi addon can be found in the eracknophobia repository or the official Kodi addon repository. Popcornflix is an ad-supported service which gives viewers access to a large selection of movies and TV shows. It has an accompanying Kodi addon which offers the same content. Ads are filtered out when you watch content through the Kodi addon. While there are a lot of titles available which aren’t blockbusters, there are top quality movies like Flash Point and Monkey King: Hero is Back. There are also TV shows like America’s Dumbest Criminals and Life on The Line. While Popcornflix is only available in Canada and the US, it can be accessed by connecting to a VPN server in one of these countries if you don’t live there. 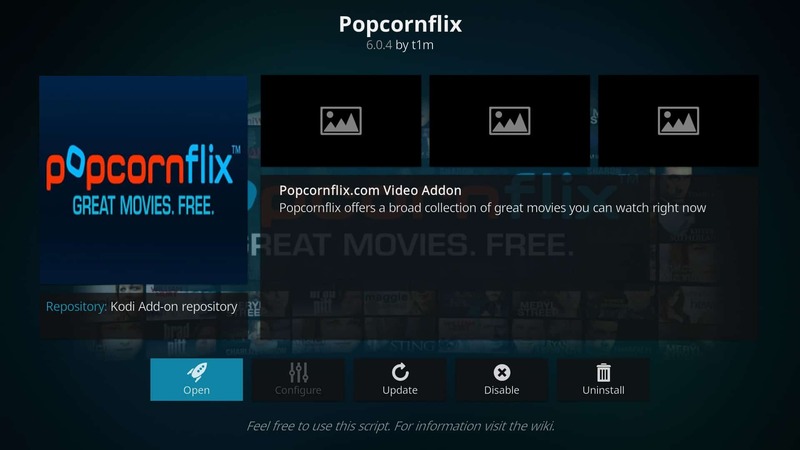 Popcornflix is available from the official Kodi addon repository. 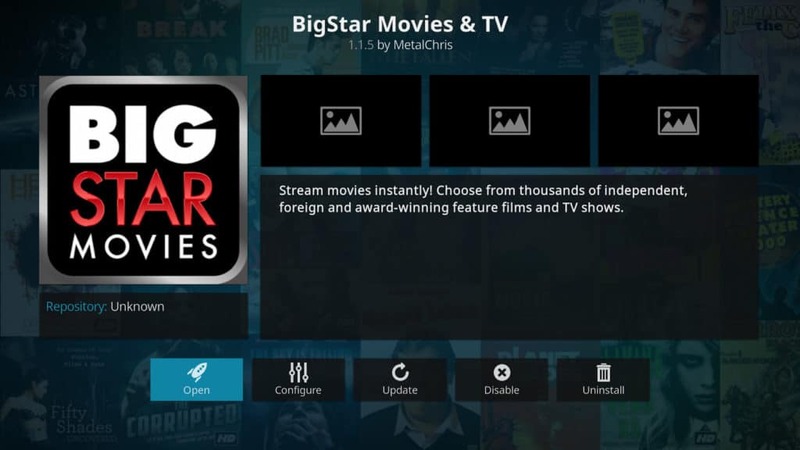 Big Star Movies is a streaming platform whose content is available through the Big Star Movies & TV Kodi addon. While there aren’t many mainstream titles, you can find solid shows such as Anonymous and Castaway Canada. In addition, there are movies such as Halloween Party, and Alcatraz Prison Escape: Deathbed Confession. Big Star Movies and TV is available from the MetalChris Repository. Seren gives you lots of content through Kodi but this content infringes on copyright laws. We recommend that you don’t use this addon. Addons like Tubi TV, Viewster, Crackle, Popcornflix, and Big Star Movies can provide you with several great titles through official streams. There is modern content available and some of it is even in high definition. If you are worried by the limitations of one addon, simply take a big picture look at all of the addons we talked about here. If you use all of these addons you will be able to access a large library of content which is more likely to contain a lot of the content that you want to watch. 3 What is the Seren Kodi addon?